If you ask conservationists in developed nations why East Africa's Maasai pastoralists hunt lions you get Anthropology 101: to retaliate against lions that kill livestock or to engage in a cultural rite of passage. Aside from mistranslations of Maasai terms in that conclusion, it is also an oversimplification of their cultural traditions and their relationship with wildlife. What is happening as a result is that not only are outside conservation efforts failing to work on basic grounds, they may even be inciting Maasai to hunt more lions as a form of political protest against outsiders and being patronized. Nuances are important because it's hard to control the hunting of lions unless it is realized precisely why lions are hunted and local buy-in is attained. Many populations of Panthera leo—African lions—are falling and the issue needs to be addressed. The species is classified as "vulnerable" on the International Union for Conservation of Nature and Natural Resources' Red List. Lion hunting is outlawed in Kenya and in Tanzania it is limited to mostly tourists who bought expensive permits - unless the killing is in defense of life or livestock. Yet it regularly occurs in both countries, often outside the law. "We saw an inaccurate representation of the exact reasons for why Maasai hunt lions, and we had a lot of ethnographic background to correct that," said Mara J. Goldman, assistant professor of geography at University of Colorado-Boulder, who collaborated with Joana Roque de Pinho, a post-doctoral researcher at the Instituto Superior de Ciencias Sociais e Politicas (Universidade Técnica de Lisboa), and Jennifer Perry, a Boulder geography alumnus now studying law at the university. They conducted 246 in-depth interviews of Tanzanian and Kenyan Maasai between 2004 and 2008 and found that Maasai hunt lions for multiple overlapping reasons, some relating to predation on livestock and some not. In some cases, Maasai said they hunted lions to prevent the potential killing of livestock, especially by lions that had killed livestock before, rather than just as retaliation. And while Maasai still celebrate successful lion hunts and the prowess of the warriors who hunt, that cultural tradition can be less of a motivation to hunt than political discontent. "We cannot agree (to compensation) because we do not have cattle to be killed every day," an elder Maasai told the researchers. "If they pay money today, then tomorrow, they will pay every day because the lion will keep coming back to eat cattle until all the cattle are gone. And then what will we do with the money?" These sentiments were expressed in a village bordering the Manyara Ranch, a Tanzanian conservation trust on which hunting is prohibited but over which Maasai from neighboring villages are meant to share governance. In the beginning, the elders kept the warriors from hunting lions, the researchers found. 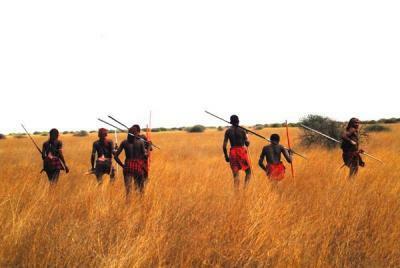 But after Maasai representation in ranch governance was diminished, the Maasai felt disenfranchised. Lion hunting increased in frequency and severity and was no longer discouraged by elders, the researchers said. "We have no reason to follow the rules," one elder told the researchers. Goldman researches human-environment relations with the Tanzanian and Kenyan Maasai, one of the most recognizable ethnic groups in Africa, known for their distinctive, colorful dress and social customs, and most recently for their lion-hunting practices. Although the primary motivations for lion hunting differed somewhat between Tanzania and Kenya, the researchers emphasize that Maasai have multiple, overlapping reasons to hunt lions: to reaffirm the protective role of young warriors, to help select brave leaders among warrior groups, to allow individual warriors to gain prestige, to eliminate lions that prey on livestock and to prevent lions from becoming habituated to eating livestock and sometimes harming people. The multiple reasons illustrate the limitations of explaining Maasai lion hunting "as either a cultural manhood ritual or a retaliatory act," the researchers write. "Participatory conservation interventions that respect Maasai knowledge and promote full engagement with management processes are likely to have far better success in persuading Maasai to change or moderate such behaviors themselves," the research team states, adding that "lion conservation projects rarely address such complex politics."